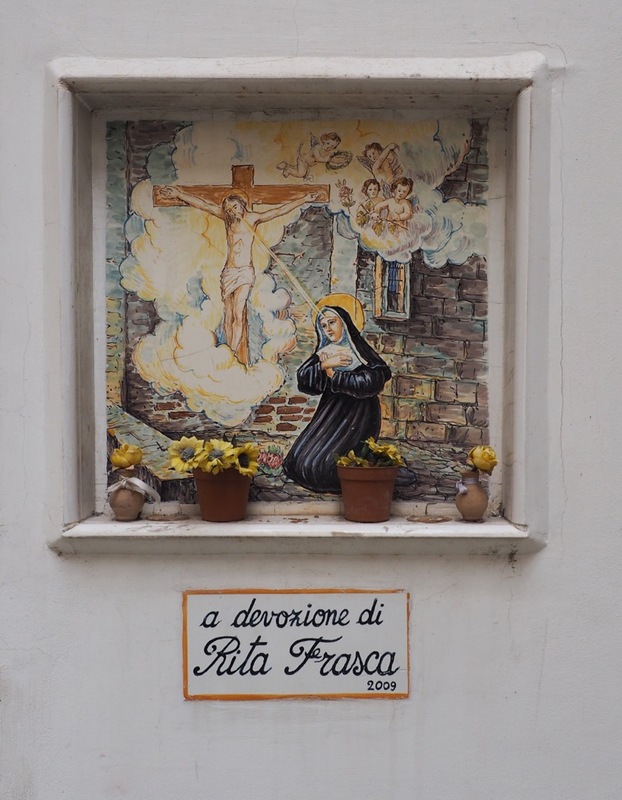 The Amalfi Coast can be a veritable tourist trap- in the literal sense. The narrow, curvy roads and the sheer amount of traffic can make it hard to move around- and even harder to get a sense of the beauty that attracted all these people in the first place. Fortunately it’s not that hard to leave the crowds behind- provided you have some good mountain legs. 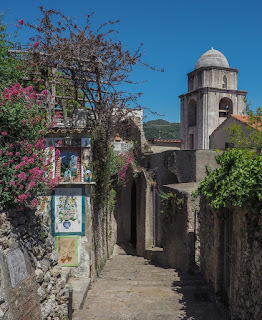 There are several small villages that are low-key, with little tourist traffic, and the best part is that they are connected by paths that offer you the best the Coast has to offer: great views across the deep blue sea, the heady smell of lemon blossoms, and quiet churches and village houses. And yeah, do bring sun screen. Lots of it. Right on the Amalfi Coast, spitting distance from the much-visited towns of Amalfi and Ravello. Map. JEAN-PAUL SARTRE surely had summer on the Amalfi Coast on his mind when he quipped ‘L’enfer, c’est les autres’ (Hell is other people). The combination of impossibly beautiful scenery and treacherous, curvy mountain roads means that, come summer, the SS 163 Amalfitana coastal road has been known to come to a complete standstill, or, perhaps even more infuriating, move at the speed of a leisurely Piaggio Ape followed by hundreds of honking cars, unable to pass. But even if you wisely decide to avoid the high season and visit in April, as Minor Sights did, you may find the Coast’s key attractions already unpleasantly crowded. As is often the case, it doesn’t take a tonne of effort to leave the crowds behind. Often, hundred meters is all it takes to get off the beaten track. 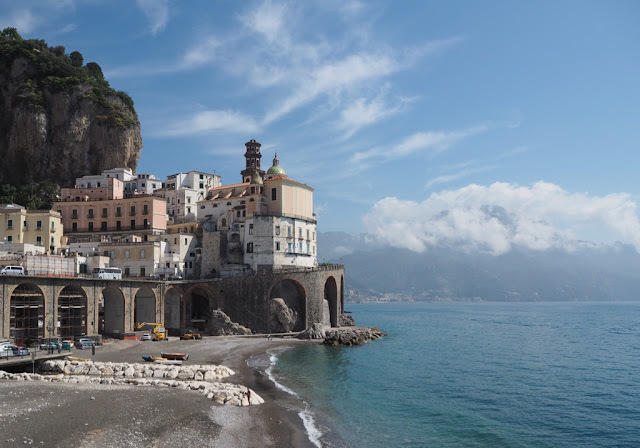 Quite literally in this case: right next to Tourist Central, the town of Amalfi, lies the village of Atrani, a sleepy little hamlet that has a few B&Bs, but no mainstream hotels. 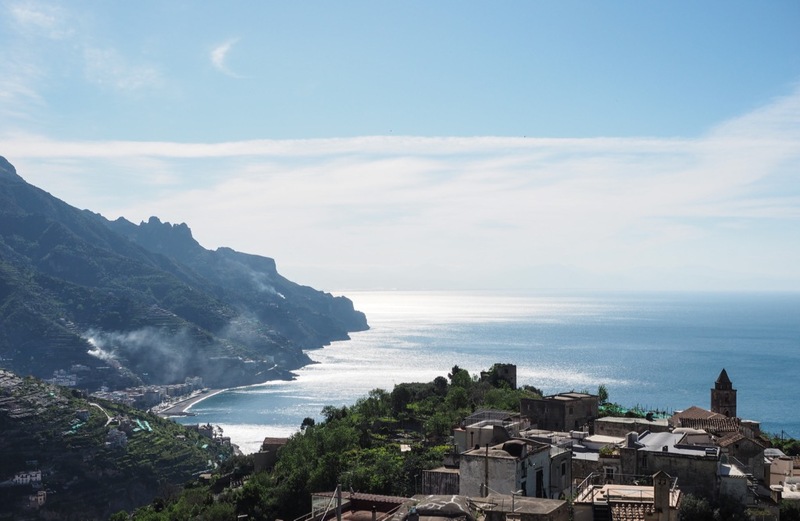 And right next to Ravello, another obligatory stop on the Costiera Amalfitana, lies Torello, a hamlet comprising only a church and some rickety houses, but sporting some of the best views on the coast. A little further down lies Minori, a low-key beach resort aimed more at locals than tour buses full of Americans and Chinese. 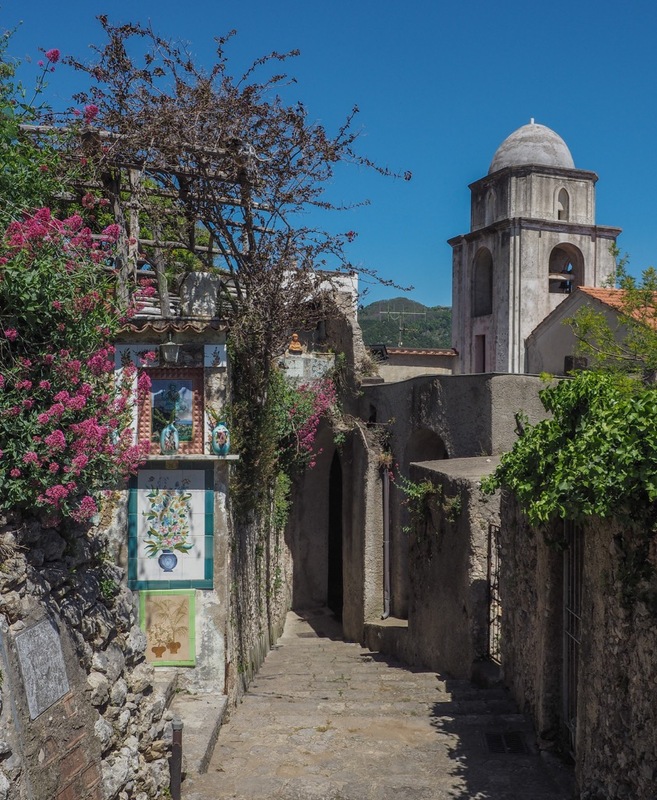 The best part is that these three villages are connected by a numerous staircases and paths, offering an inconspicuous way to go from one to the other, whilst taking in the best the coast has to offer. 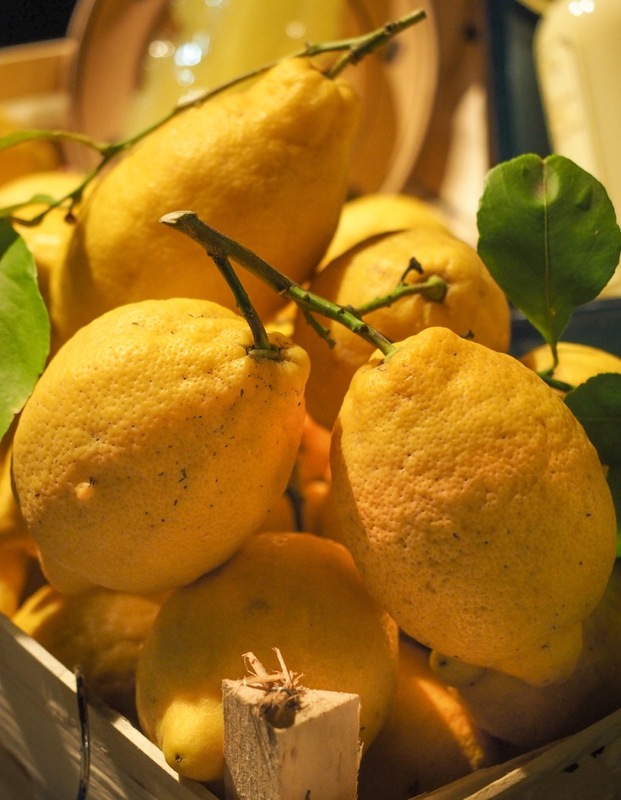 Many of these trails lead through the famous lemon groves, the source of all this limoncello flogged by every other shop in Amalfi town. Let’s start in Atrani. There’s not much in the way of entertainment in this little town, which looks like it’s been dropped in the valley between two giant cliffs. There’s a small beach (sandy, not made of pebbles, like Amalfi’s beach). There’s a church so picturesque that it could easily win Italy’s annual ‘postcard picture of the year’ contest. You could hike up to the Sanctuary of Santa Maria dal Bando, set high on the western side of the Valley- do check if it’s open before setting out, unless you’re just looking to warm up your calf muscles... Keep an eye out for the many colourful tiles sporting devotions or simply house numbers. 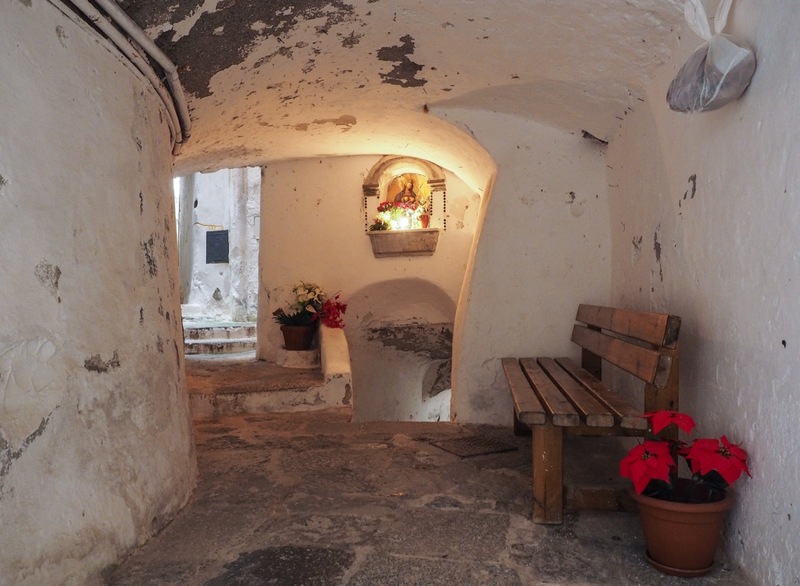 Covered passage in Atrani- replete with a bench in case you need a break. Ouch! Jesus just hit me with his laser beam eyes! Apart from steps, you’ll see lemon trees- lots of them. You’ll smell them too- lemon trees bloom all year round so you’ll be surrounded by the sweet smell of blossoms all day long. Many of the lemons trees are covered to protect the foliage and fruit- you can still smell them though! It’s a stiff hike up, up, to Ravello, but fear not, you’re now at the highest point of this journey. 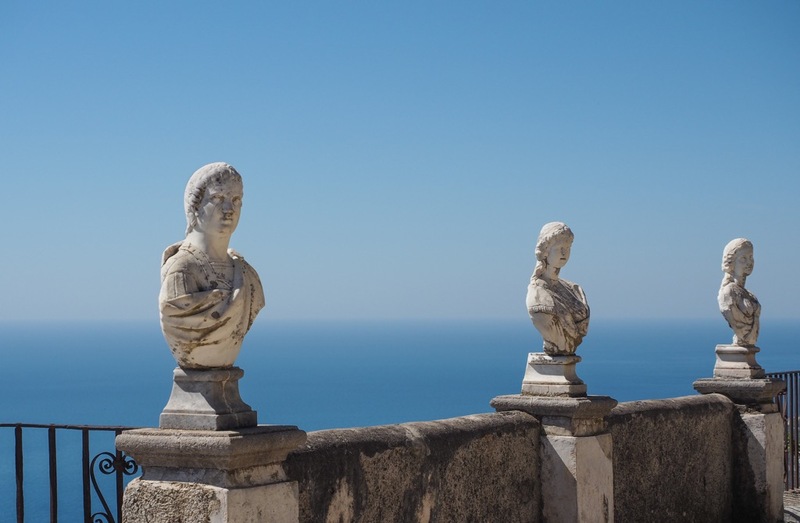 Ravello is pretty, rather touristy, but it does enjoy stunning views. For the best views, make your way over to Villa Cimbrone, which has its own Minor Sights article. From Ravello, take the narrow passage just to the left of the other major garden, Villa Rufolo. You’ll be following the signs to Minori. A good segment of the path is covered, providing some welcome shade. You’ll stop by numerous churches, some of them with extensive porticos. You’ll also pass more lemon trees. And there will be more gorgeous views. Torello is just a hamlet- blink and you’ve missed it. A few thrown-together houses and a church is all there is too it. But the path continues- and all the way in the distance you’ll see the town of Minori, which sports a large (by Amalfian standards) beach and a generous dosage of seaside cuteness. It’s a good 2km from Torello to Minori- all the way down, so this is the easy stretch. 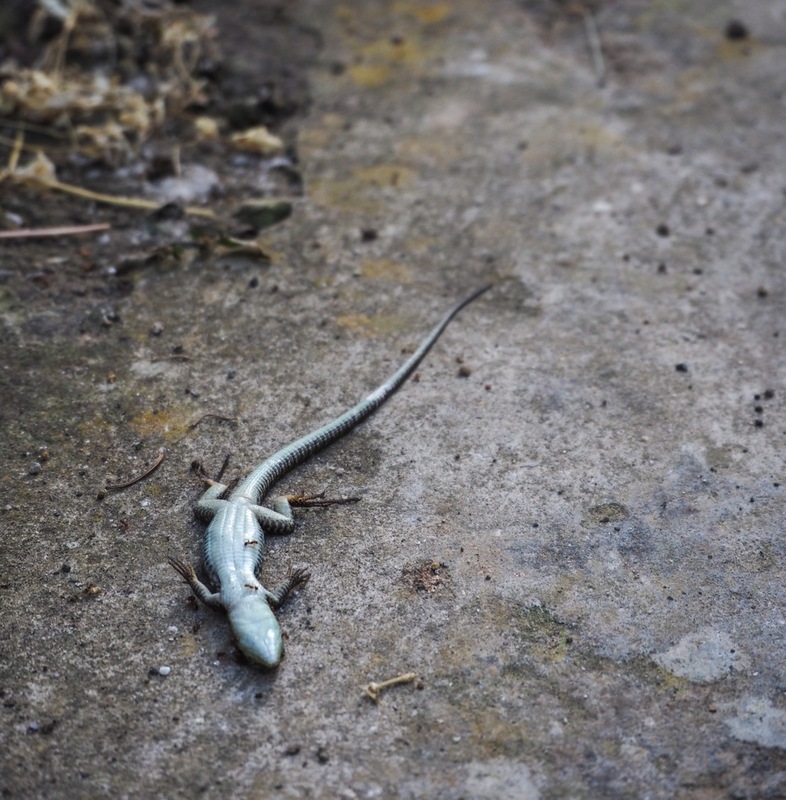 Again, there’s plenty of sea views to enjoy, as well as more lemon trees, and lots of (dead) lizards. Minori in all its glory. You could of course simply retrace your steps... provided your legs have not turned into jelly yet (usually it takes another 24 hrs before you really notice). There are also frequent SITA buses that ply between Minori and Amalfi, so if you want to cheat, go ahead, we won’t tell anybody. As noted, the paths are well signposted. 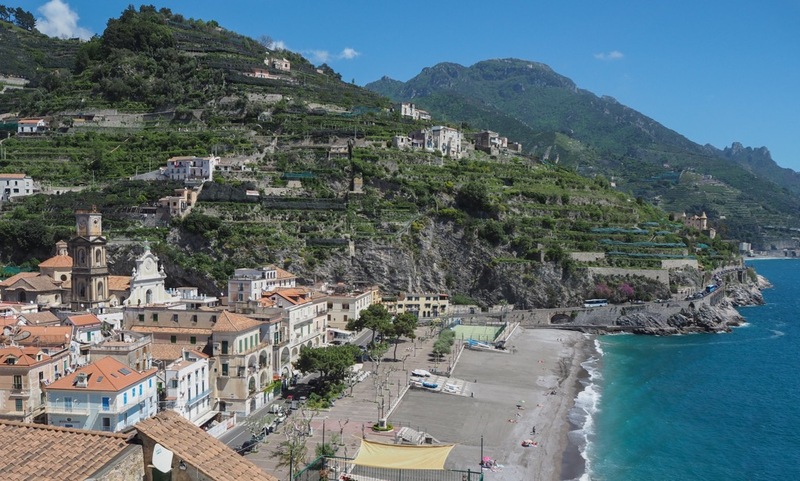 The route can be done in either direction- from Atrani, follow signs to Ravello and then on to Minori- in the other direction, simply reverse the order. The paths are well maintained. You could also split the journey in two, by basing yourself in e.g. Ravello or Torello and descending and ascending on different days. B&B Al Borgo Torello makes a good base. In total the whole journey covers about 5km- but the steep ascent can make for slow going, although somebody of moderate fitness should have no problem tackling this trip, provided it’s not too hot. Planning a trip summer 2018 - June. Love the idea of Positano but worried about the crowds. Considering Minori because it has a ferry stop. Thoughts? They're very different! It just depends on what you want to get out of this trip.... If it's quiet walks you're after, Minori would be an excellent option. Thanks. 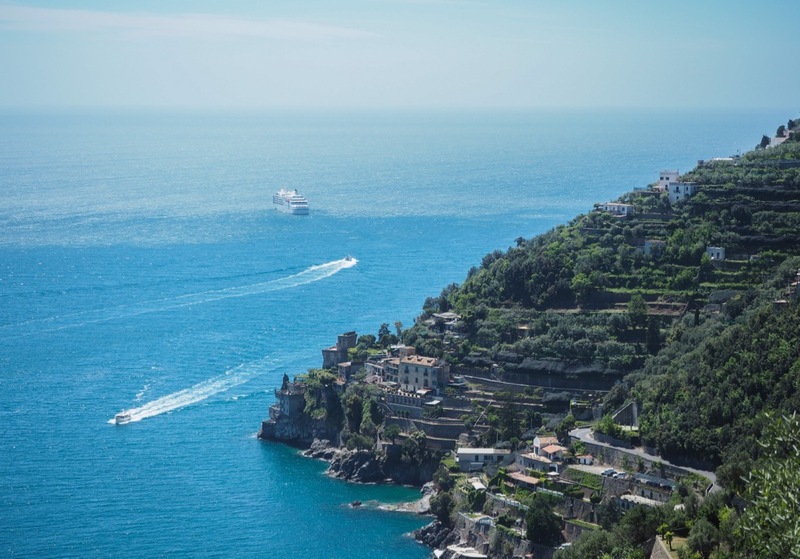 Like Positano for the picturesque setting, restaurants, and access to ferry stop. But hate crowds. Thinking Minori would provide the quiet atmosphere we like, but don't want to sacrifice transportation options, food options, or scenery. 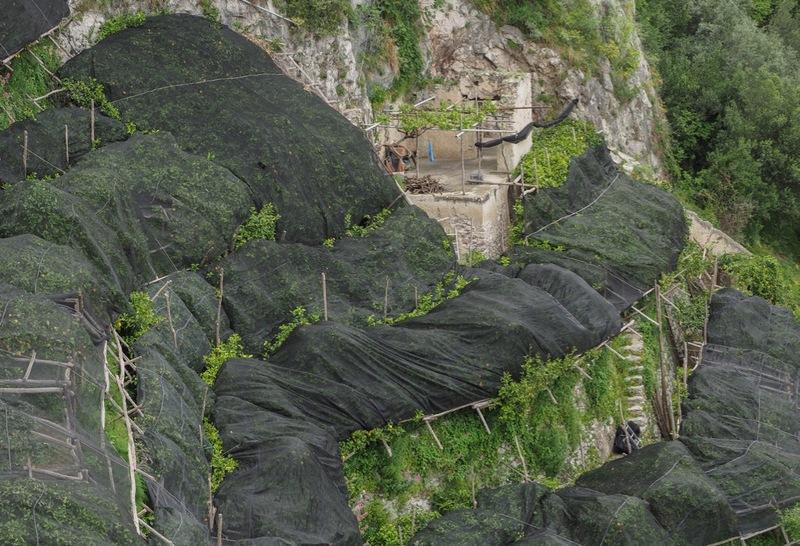 Is there a ferry from Minori to Amalfi in summer? Are there markets and restaurants? 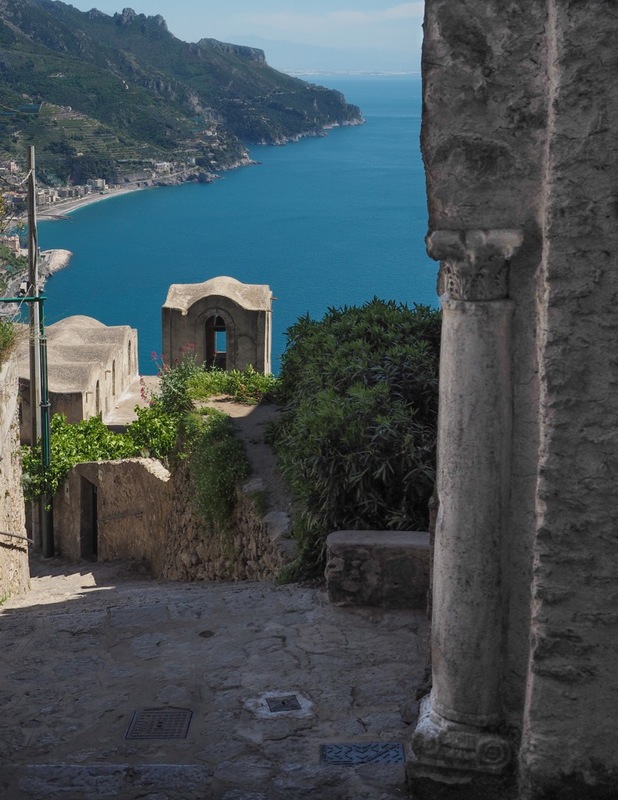 Plan to hike Path of gods, see Ravello, boat trip to a grotto and around Capri, and hike Capri. So need a decent transport hub. Thank you! Hi! I'm going in march for my honeymoon, and we're really interested in taking a few paths (we are staying in Amalfi, probably). A few questions: How long does it takes to complete the walk you descrive? Is it too intense or is it doable if you're not trained? And, finally: if the path had proved to be too much, is there a way back by bus? hi Patricia, the walk would be 2-3 hours in total- it depends on how often you stop for pictures, maybe to look around one of the villages... you can also stop in Ravello. 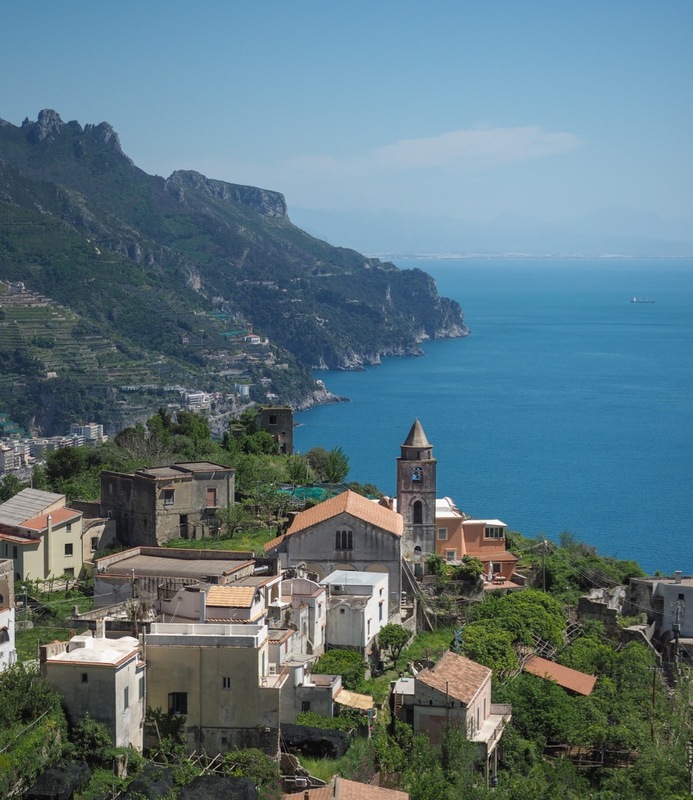 As we said in the article, there's a bus from Minori to Amalfi, and also from Ravello. We're not sure what you mean by 'trained'. This is a leisurely country walk. As long as you're not morbidly obese or incapable of walking or climbing stairs, you should have no problem with this... Have fun and let us know how it goes! 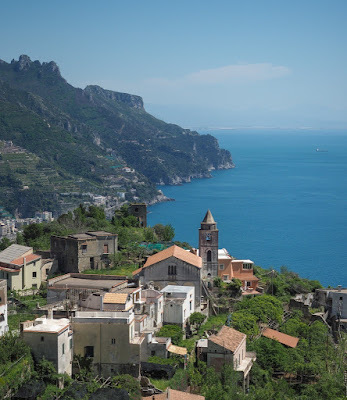 We are staying in Praiano for a week and as soon as I found your site and read about the path from Atrani to Ravello, I knew it was the perfect adventure for our family. We started right at the bottom of Atrani by the postcard perfect church you mention, on Via dei Dogi. It took us a couple of tries to finally find the right stairs to start going up. We are a family of four with two boys ages 10 and 8, we our pace was slow and enjoyable (not too slow, they acting did very well since they are used to walking everywhere by now!) Everything was exactly as you described on the way up to Ravello, the signage, the steps, winding roads, lemon trees, etc. What was omitted from your description that made me a little scared (especially with kids) is that two segments of the walk, we had to walk on the very busy roads with cars, motorcycles, tourists buses, etc. Considering that this road, SS373, is very narrow and cars drive at high speed, AND, they is no space for pedestrians... there is a 12” space from the white lane on the street and the cliff, not very big and very dangerous to say the least. After this very scary segment of the walk, we were relieved we were still alive and made it to the last portion of stairs for the final stretch to beautiful Ravello. Thank you for the recommendation, it was truly worth it! 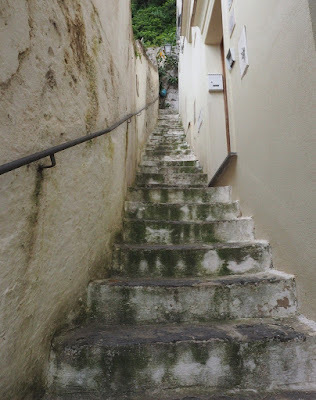 A side note is to mention the very dangerous portion of walking on the very narrow street full of cars SS373. That way families can choose accordingly, especially if you have kids.